Good news for new parents: the Wadsworth Center’s Newborn Screening Program has developed a more precise screening tool for cystic fibrosis (CF), alleviating the anxiety that accompanies a false positive test and the need for additional diagnostic testing. The new test uses Next Generation Sequencing (NGS) to analyze the entire gene for cystic fibrosis, known as CFTR. The new screening test will be added to the two other tests Wadsworth currently uses to screen for CF. 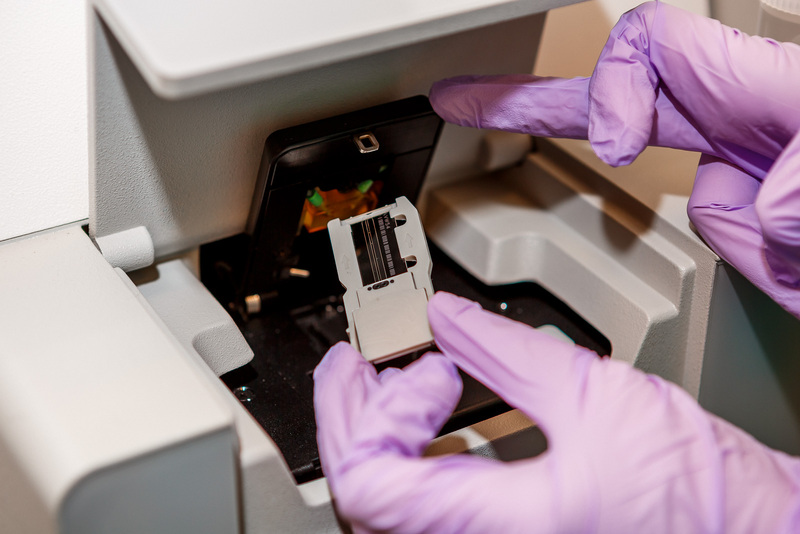 Sequencing is performed at the Wadsworth Center’s accredited Applied Genomic Technologies Core. Approximately 900 babies are referred for further testing for CF each year, even though only about 40 actually have the disease. With the new screening test, only about 100 babies are expected to be referred for diagnostic testing. All infants born in the U.S. are tested for CF and other treatable conditions at birth. New York State screens for 47 conditions. Babies who screen positive for CF are referred for additional testing at specialty care centers, so a diagnosis can be made. Tests currently used by the Newborn Screening Program to detect cystic fibrosis do a very good job of picking up all infants who could potentially have the disorder, but they also catch a number of those who don’t have the disorder – false positives. But because of the high number of false positives, the Newborn Screening Program did a pilot of a new CF test that has a lower false positive rate. Research shows the new test produced 81 percent fewer referrals for diagnostic testing. Current CF screening is actually a series of two tests. The first test (tier one) measures immunoreactive trypsinogen (IRT), a pancreatic enzyme precursor. IRT is elevated in most people with CF due to abnormal pancreatic function. Even though this assay is designed to detect CF, newborns with other conditions, and even carriers with no CF disease, may also screen positive. Specimens with IRT levels in the top 5 percent go on for second-tier testing, which consists of genetic testing for 39 common mutations causing CF. The problem is that there are actually more than 2,000 mutations known to cause CF, so disease can’t be definitively ruled out in babies found to have only one mutation or no mutations. The Newborn Screening Program will perform NGS sequencing on the CFTR gene in specimens with elevated IRT and one mutation, or in specimens with very elevated IRT and no mutations. If additional mutations are not detected by sequencing, the newborn will not need to be referred. The new test does not have a start date yet, but Dr. Caggana expects it to be in use this Fall.